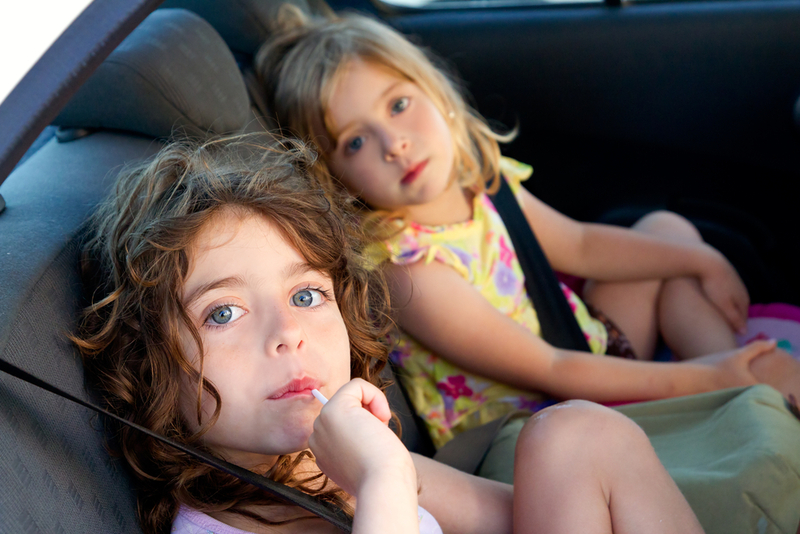 It’s easy to forget just how boring long drives can be for kids. I distinctly remember half-term journeys with my parents where the only thing to do was fidget. And in those pre-DVD days, a TV/VHS combo was just too big to strap onto my mum’s headrest. Not everyone wants to simply plug in a DVD player or hand over their mobile though, so here’s our top 10 (screen-free) ways to keep the kids entertained in the car. An obvious one to begin with, but no list like this is complete without the evergreen classic. Name something that everyone else has to find. It can be easy (a blue car) or difficult (reasonably priced service station sandwich). The first person to spy the target is the winner. Starting with A, each player has to add an item to a shopping list, memorising the whole list until they reach Z. Best avoided if you have younger children, where remembering not to touch hot things is a challenge, let along remembering 26 grocery items. One person says two ‘facts’ and tries to sneak in a fib, too. For example, “I’ve got a blue bike”, “We went to the zoo last weekend”, and “I brush my teeth every night.” Everyone else then tries to guess which one is the fib. It might date from the 19th century, but this traditional parlour game is still a lot of fun. One passenger thinks of a famous person, place or thing, while everyone else takes turns asking up to 20 questions to try and figure out what it is. Questions can only be answered with ‘yes’ or ‘no’, and whoever guesses correctly thinks up the next one. When I was young, we used to play this on the school bus where the first person to spot a VW Beetle got to nominate a friend to do a forfeit. This friendlier version is more suitable, whereby you pick a colour, make or model of car, and the winner is the first one to spot 10 of them. This is one for older children. Everyone has to try and make a word from the letters on the numberplate of the car in front. In the correct order, too. So, if the plate is HN07 RKE, then ‘HANDBRAKE’ can be made. A fun side effect of this game is that it makes everyone more vigilant for number plates that spell out ‘POO’. The only game on this list that requires any sort of preparation, you can play car bingo with a pen and piece of paper. Simply draw a grid and in each square write something that can be spotted through the window: cow, police car, tractor, rainbow etc. You can make the grid as big or small as you like, and the objects as easy or hard as the children can handle. First of all, pick a subject. Let’s say football teams. The first person names a football team (e.g. Sunderland) and the next person has to name another team that begins with the last letter of the previous word (e.g. Doncaster Rovers), and so it continues until someone gets stuck. You can use countries, animals, films… just about anything. Pop a CD on, plug in an MP3 player, or try the radio. Make a game of it where anyone not singing along has to perform some kind of forfeit, like carrying in the shopping on their own. That won’t happen though, because everyone loves singing. If you’re feeling particularly devious, you can use it as an opportunity to try and influence your kids’ taste in music! Nice tips. I’m going away this weekend so this advice might well come in handy. I can’t believe the BBC example I saw suggested arm wrestling. Whatever next, bare knuckle boxing?